One Pretty Little Box: Gorgeous Blogger Award! ~ I accept! 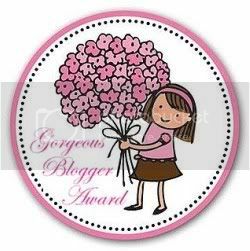 Gorgeous Blogger Award! ~ I accept! Annie from The Amazingly Shrinking Girl sent me a lovely blog award! I am honestly HUMBLED and honored all at the same time. 2. President Woodrow Wilson is in my bloodline on my mother's side. I do not remember if he would have been an uncle or a grandpa somewhere down the road (think great great great LOL). 3. I have a passion when it comes to buying cleaning supplies! I love them! The new ones come out, I will at least try them once! 4. I used to be a licensed beautician. I did do hair for a while out of school, but it was alot of work for a little bit of money, and unless I was going to get into a high end salon or own my own, it wasn't going to be beneficial. So.. I went into retail and it was the BEST move possible for me and my personality. 5. In my heart, I secretly hope to be "discovered" for modeling the "typical mom"! 1. Julie ~ She has turned her life around i more ways then one. Everyday she wakes up and wants to just make a difference in her own life, as well as her children's and those around her. She is an inspiration to many. 2. Lisa ~ Girl, you have been keeping up with me far longer then anyone I can remember! I have grown to love our friendship! 3. Cheryl ~ Mrs. Cheryl you inspire me like no one else! May God bless you for all you do and all you share! I truly want to be like you when I grow up! 4. Barbie ~ Because I don't think she knows how beautiful she really is! 5. Shelly ~ I know I have a prayer buddy when your around! I love you girly! 6. Sue ~ You probably have already been awarded one of these, but I heart you and your outlook on life. 7. Sharon ~ A new reader of mine, but I am falling in love with this lady already! And.... she is about to be a newlywed! !